As I got home from baseball practice tonight, I was surprised to find a rather large crowd gathered in my street, pretty much right in front of my house. Parked amongst the people were two tow trucks, a police motorcycle and a van from the fire brigade. Before I could get worried, though, I noticed the collective attention was focused on the canal across the street from my neighbours’ place. 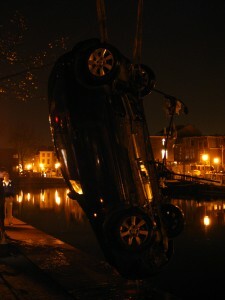 A car had gotten into the canal from the other side and had floated over to my side before settling on the bottom. The two truck people and some divers from the fire brigade were just busy pulling it out again. No one was inside when the car went down. Most likely the owner had forgotten to apply the hand brake, or it had somehow failed. The parking spaces across the canal face the water, are slightly slanted, and there’s no fence or anything. Gravity, apparently, was happy to do the rest. The owner watched quietly as his vehicle slowly resurfaced and was lifted onto one of the tow trucks. He didn’t seem too upset at his loss. In fact, when one of the onlookers thanked him for letting something happen on an otherwise quiet night, he managed to maintain a sense of humour. I hope someone also thanked him for a reminder to us all to always check the hand brake when parking on an inclination. A colleague of mine accidentally forgot to apply her (yes, it was a woman) hand brake the other day at the parking space near the office. Gravity there was also very happy to let it roll towards a small tree. No real damage here, but it looked kinda stupid. There’s your comment. WordPress’s spam filter had marked it incorrectly as spam.